Note: this text is meant as a simplification of laser physics. Laser, or Light Amplification by Stimulated Emission of Radiation (If we want to get technical about it), is a device that emits Light through an Amplification based on Stimulated Emission of electromagnetic Radiation. 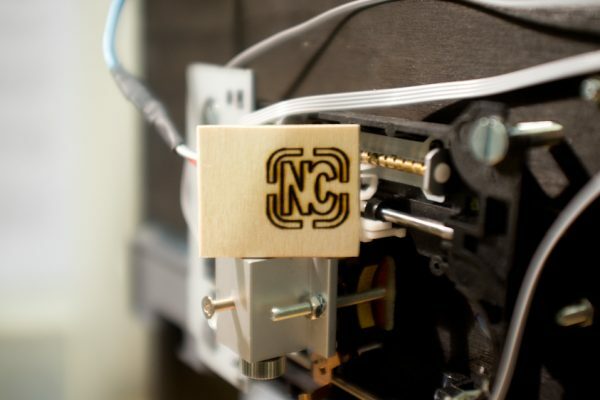 This post is not meant to explain the everyday applications of lasers, but rather to look a bit closer at how they actually work. where LA is the process, SE is how it is done (emission is stimulated), of the R– radiation. In other words, a device that amplifies and emits electromagnetic radiation. We will describe these three parts in detail. The laser has the important properties of emitting coherent light, which means that the light is all polarized in the same direction, and is in phase, unlike a light bulb that emits incoherent light in all directions. The emitting light is monochromatic, which means that it is of a single wavelength. When we think of a laser, we often think of a laser pointer, which is in the frequency range of visible light. Meaning, we can see the laser as a single color. Another example is a Blu-Ray player with a wavelength of around 405nm and emitting blue light. Light bulbs, on the other hand, emit white light, which is a combination of all colors, and therefore a combination of wavelengths. Just to clarify, a laser can also emit “invisible” light, light that it is outside the frequency range of visible light (see picture below). Just think of a police speed control where they “shoot” a laser to measure the velocity of a car or a fighter jet that measures the distance to a target with a laser. In both scenarios, the laser is invisible to the human eye since invisible light is being used in the measurement. 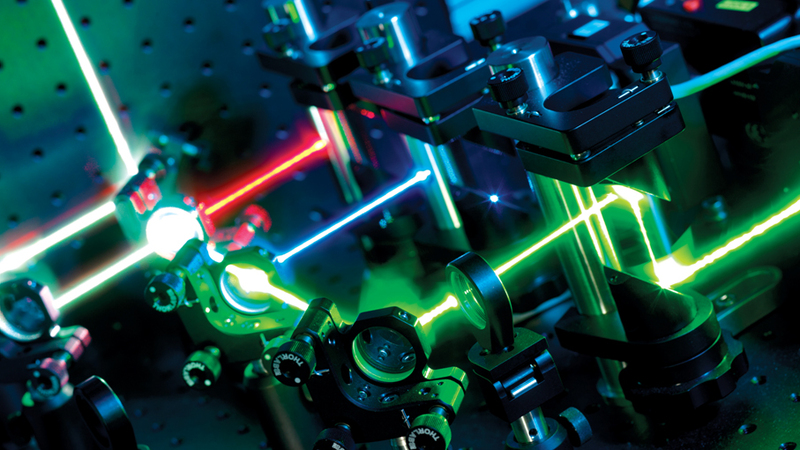 Different wavelengths correspond to different energies, so using a laser that has a single wavelength could be used for studies of analyzing substances with certain energies. Let’s investigate this relationship between wavelengths and energy a bit closer! 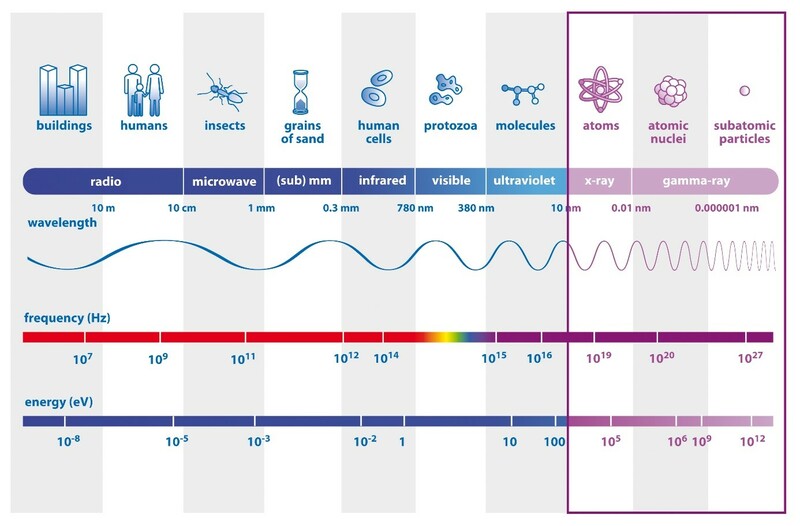 Light is the electromagnetic radiation of any wavelength within the electromagnetic spectrum, as seen below. But when we talk of light, we usually think of visible light. Visible light propagates as waves just like any other electromagnetic radiation, and is made up of the wavelengths of around 400-700nm, lodged between infrared and ultraviolet light. If we go one level deeper, we understand that light is the energy of electromagnetic waves. 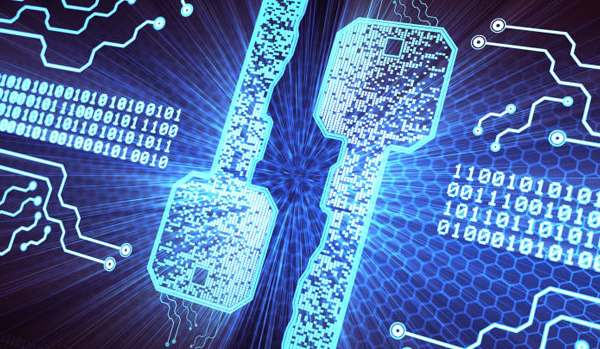 This takes us briefly into the realm of Quantum Physics. Brace yourself, this might get a bit hairy. These packets of energy have particle-like properties, and this is what is called a photon. Energy exists in these discrete packets of quanta, and if we look back at the electromagnetic spectrum we see that we have low energy photons on the left (radio wavelengths), moving through greater and greater energies, to gamma wavelengths on the right. Remember that because energy is proportional to frequency/wavelength, the higher frequencies , the more likely you may have higher energetic photons. So how does a laser really work? As you probably remember from middle school (or elementary school), an atom consists of different energy states. We will consider two different states of an electron. Electrons can be excited from one energy state to another by transferring energy from an external source. So, if a photon (light) comes across an electron in a lower energy state, it can push the electron to a higher energy state. The energy of the photon is now a part of the excited electron. As the electron is stimulated, it absorbs the photons energy. This process is called Stimulated Absorption – the absorption of a photon by an electron. After stimulated absorption, we have an excited electron. But the electron will not stay in its excited (upper) state for long, and will “quickly” fall from its excited state to its original state. When we say quickly, we mean roughly 10-8s (in some cases, although the time varies for different materials). When it falls to its original state, it will release a photon with energy equal to the difference in the energy states. The higher the fall, the higher the energy of the emitted photon. If the energy of the photon is in the visible range of wavelength, then we would see it as color. This process is called Spontaneous Emission – the emission of excited energy, i.e. a photon from an electron. The last process is when a photon interacts with an electron that is already excited. 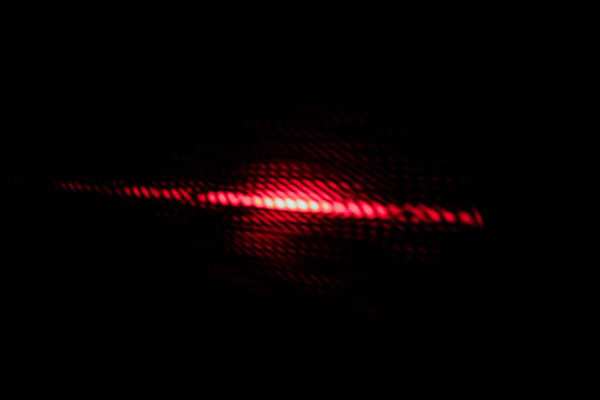 This new photon can force the excited electron to fall back to a lower energy state and emits another photon. We then have two photons: the incoming(stimulated) photon and the emitted photon from the electron. 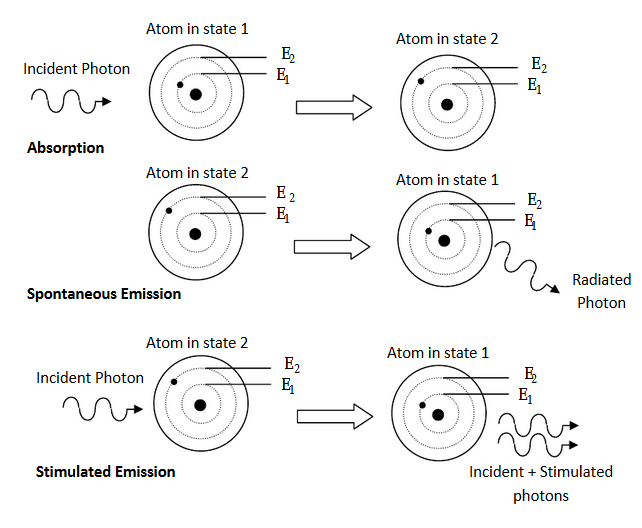 What’s important about this process is that the emitted photon will be identical to the stimulated photon, because the incoming photon has to be of the energy difference between the two states, E2 – E1, and the new emitted photon is by definition the released energy of the electron going from state 2 to state 1, again , E2 – E1 (See the picture above). Therefore the two photons will be identical, and have the same energy, frequency, phase and polarization – they will be coherent with each other. Inside the “laser medium”, there are two mirrors, where one is 100% reflective and the other is partially reflective. When photons are created through spontaneous emission, they will travel in random directions, but the ones travelling perpendicular to the mirrors will reflect back and forth. This will cause more and more photons to be emitted, thus amplifying the laser light. Some of them will escape through the partial reflective mirror, and this is the laser beam that we see. To summarize, lasers are complex devices that emits amplified light of a single wavelength in a specific and focused direction. But, what can they be used for? Stay posted for new laser 101 blogposts – next time we’ll look into industry applications for our good friend the laser. Introduction to Quantum Mechanics: Particle or Wave?